Here s a wonderful offer. “Little Hercules” special steam engine. Made by “Weeden,” world s leading maker. This engine is of tine quality and highly finished in bright colors. Has heavy fly wheel smooth-running piston and heavy cylinder. Strong boiler and fittings. Large fire box. Pulley wheel that will run mechanical toys like Erector, Meccano, etc. Runs on alcohol or canned heat. A big, POWERFUL, high-quality steam engine. Just what you’ve been waiting for—and you can have it FREE! Read special offer. The Open Road Tor Boys is a 50-page boys’ magazine just crammed brimful of thrills The kind or blood stirring stories you’ve been looking for. Tales of high adventure on land and sea. Air stories that take your breath away, of war pilots in deathly combat above the clouds, or mail pilot heroes Sport stories, school stories, tales of distant jungle lands, etc. No other magazine has stories like these. Best joke page published. World-wide correspondence club, friends in foreign lands stamps, boy mechanic, tells you how to make all the things you want. OPEN ROAD PIONEER CLUB; best dope on hunting, fishing, camping. Contests galore with prizes for all. Extra money. One whale of a magazine say 200,000 readers. Red blooded stories for red blooded he boys. Read special offer. Regular subscription price to Open Road tor Boys is $1 a year (half or others). To make new friends we will send you the magazine for a whole year, twelve fat issues for $1—and send you this wonderful steam engine FREE. This is a great offer. Act quickly. Don’t wait. Get your steam engine and have your fun right now. Ask Dad. He’ll tell you Weeden means top quality and he’ll tell you what a grand offer this is. Send coupon today. 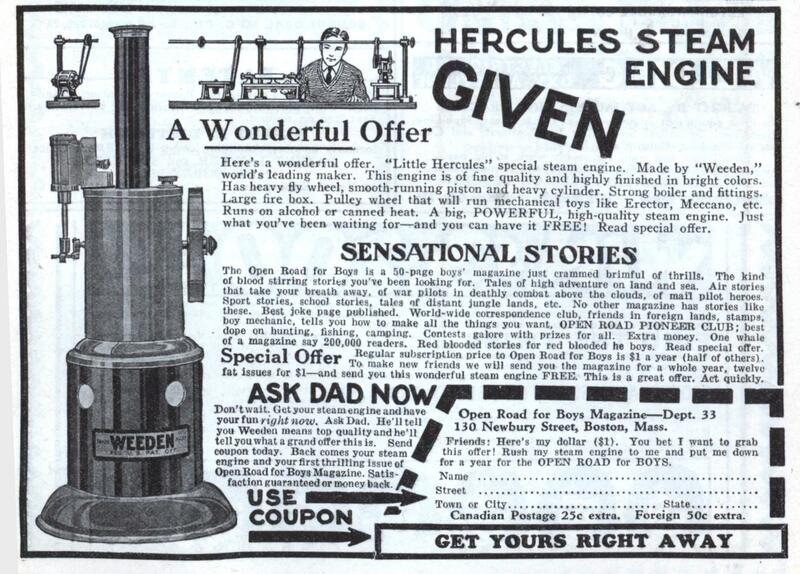 Back comes your steam engine and your first thrilling issue of Open Road for Boys Magazine. Satisfaction guaranteed or money back. Open Road for Boys Magazine—Dept. 33. 130 Newbury Street, Boston, Mass. Friends: Here’s my dollar ($1). You bet I want to grab this offer! Rush my steam engine to me and put me down for a year for the OPEN ROAD for BOYS. 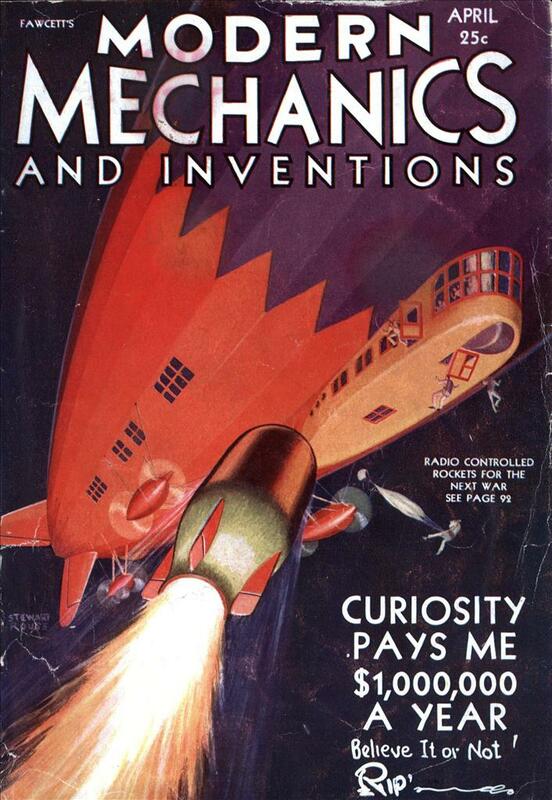 I really wish more magazine subscriptions came with free steam engines. LCD world clocks just don’t have the same torque. That’s one highly collectable subscription premium! Too late for Christmas this year, unfortunately. Neato! I think it would have be cool to make a steam powered iPad and micro USB charger using that! Well, there’s a camp stove that burns twigs and has a USB port available – see Biolite.com for details. No moving parts, but you can make tea. that is very very cool! one thing I noticed is that it does not seem to have the ummph to charge an iPad which is what I mostley use but I still like the steam powered iPad charger idea. @experiment 626: Thanks for the correct link. As to charging an iPad – NOTHING charges iProducts very well unless there’s a steady current source, so most people who use solar/bike/etc chargers use them to fill up a battery, then charge the iThing off that. The Biolite has an internal battery, but I think it’s fairly puny, as its main function is to power the forced-draft fan. Here’s an interesting seasonal tie-in: In the modern classic movie “A Christmas Story”, the Red Ryder BB Gun ad that Ralphie hides in his mother’s magazine is supposed to be the back cover of “The Open Road For Boys” magazine, the publication offering the steam engine here.